For many tourists, a trip to Munich is never complete without a visit to the Hofbräuhaus brewery. And while there is nothing wrong with hoisting massive beer steins while swaying to Oom-pah music – putting the proverbial beer goggles on in the process – the Bavarian capital has far more delicate pleasures in store. 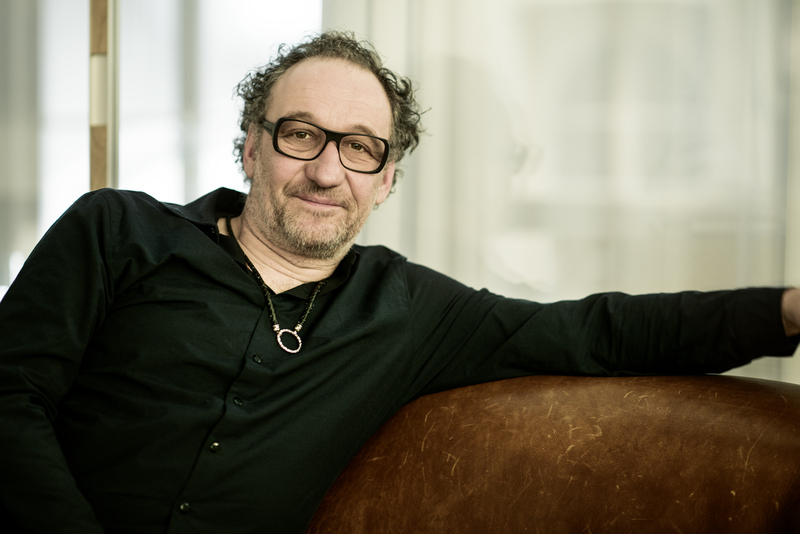 Take FreudenHaus optical shops, for instance: Started by Uwe Pinhammer and business partner Stefan Flatscher more than 20 years ago, FreudenHaus has become a prime destination for local stars and style aficionados alike. So while visitors can still put on their beer goggles at the Hofbräuhaus, for the kind of renegade eyewear styles that can hardly be found anywhere else, FreudenHaus is surely the way to go. Here’s the inside scoop. Hey Uwe, what’s happening in the Munich scene right now? Since when has FreudenHaus been in business? In 1991, Stefan Flatscher and myself founded FreudenHaus. And even 20 years later, the partnership is still strong. In 1992, we opened the first store on Dietlindenstrasse. The old Art Nouveau villa was perfect for realizing our dream – no money in our pocket, but doing it big! In a total of 14 rooms we’d showcase our own collections. That was amazing for the time. And in the same year, we launched the first four pairs of FreudenHaus glasses, and we’ve just never skipped a beat since then. In 2001, we opened our flagship store on Odeonsplatz square, and in 2006 we added FreudenHaus US in Palm Beach. 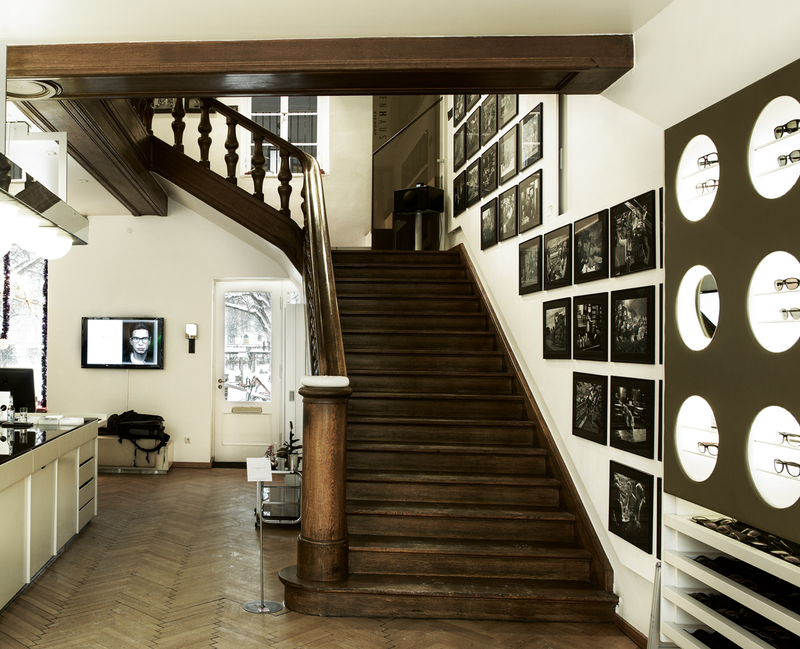 In 2010 we added another store on Theatiner Strasse and took on the distribution of Converse Eyewear in 2011. So it’s been far from a boring ride. Really looks like it. What was the motivation behind FreudenHaus? There were three of us at the time, Flatscher, Funk & Pinhammer. We were working together at Bavaria’s most en-vogue optician. Somehow we were like the “Enfant Terribles” of Munich’s optical industry. We would sell eyewear from 9AM-7PM, then go straight into the “Einser” club, partying it up. Every day, every night. At some point we started hosting our own parties, and they grew into something really big. People in Munich knew who were, but we were also just employees and couldn’t really live out our madness. We were having a lot of fun, though, and realized that we might as well channel our energy into our own business. And we took a rather megalomaniacal approach and opened a 500 square meter store with no money to our name, also in a rather disadvantageous location. We worked until we dropped. Well, like I said before, the fun aspect of life and work was always our main focus. And then we also had a villa, a huge house, if you will. 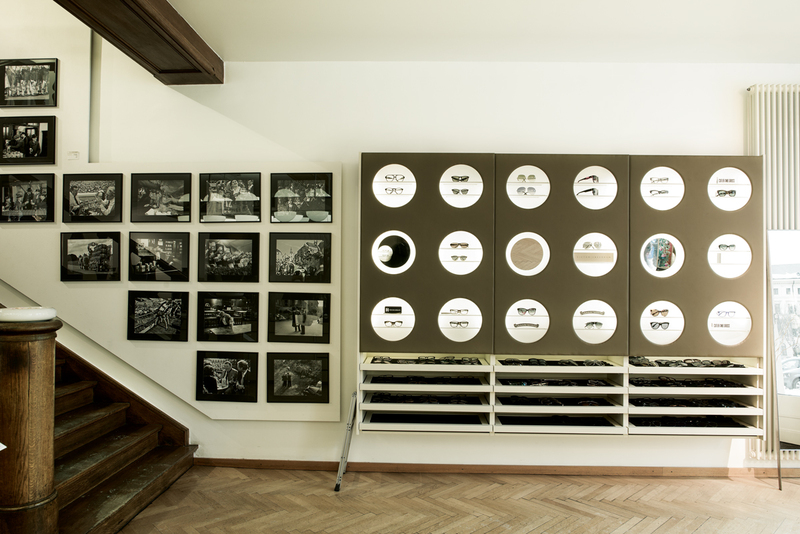 So the pleasure (“Freude”) in our house of eyewear turned into the moniker Pleasure House – FreudenHaus. And of course, the pun on a house of ill repute was totally intended, but never our main angle. You’re currently running two FreudenHaus locations in Munich within walking distance of each other. Is that cannibalizing your business? No, just the opposite, it’s really important. The small store on Theatinerstrasse is the one all the tourists pass by. They don’t make it all the way to our main store, so it’s important to have two stores in downtown. And every year during the summer, we’re opening a sunglasses store-in-store at Ludwig Beck on Marienplatz square, which has been highly successful for us. On a good Saturday, you’ll get footfall of around 10,000–15,000 customers. Do the stores carry different labels? At the Theatinerstrasse and Ludwig Beck locations, we get more tourists than in our main store on Odeonsplatz square. This is why our line-up is more label-oriented and opportunistic there. We did “beauty to the death” for long enough, now we sell whatever is currently happening out there, what people ask for. At the main store, the spread is like this: 70% of our own, FreudenHaus-distributed products, 20% special products such as Retro Specs, Cutler & Gros, Goldsmith etc. and famous labels such as Tom Ford or Chrome Hearts. We don’t sell Ray-Ban and the like here. Will there soon be another FreudenHaus location on Munich’s map? After our store in Schwabing fell victim to demolition bulldozers after only four years, we’ve been on the lookout for another location in our native borough, Schwabing. We’re currently negotiating, but nothing is finalized yet. The Gärtnerplatz district is also high on our list. But we’ll only open a new door if everything’s the right fit. The people, the location and surroundings – we’re not interested in boring new building stock. The atmosphere at your stores is more of an avant-garde fashion boutique vibe than a specialized optical store. How do you see yourselves? You got it. Running a store for us is not an end in itself. The idea behind every store has to be a good fit. That’s why all our stores tend to look different from one another. Marie, our architect, is a super-creative mind – we don’t do “run of the mill.” Whenever she picks up pen and paper, the results are bound to be outstanding. Judging by your interior design, I suppose your clientele is rather fashion-oriented? Sure, the first impression from stepping into the door is very polarizing – and it has to be, otherwise you’ll only get customers that will browse the selection but never buy anything in these high-rent locations. We focus on customers that are far from indifferent about what they’ll wear on their faces. These are fashionable people, but also originals that are setting new fashion trends, such as Vogue Germany’s editor-in-chief, Christiane Arp. We pay close attention to what she’s wearing on her face at any moment. Munich is a great place to meet illustrious characters and plenty of celebrities. What kind of extravagant personalities are frequent FreudenHaus customers? Quite a few: I’m about to meet [actors] Götz Otto and Axel Milberg for coffee. And on Sunday, [actress] Katja Flint and [celebrity chef] Eckart Witzgmann will drop by. Our celebrities are less the flamboyant type, they tend to be successful at what they are doing. Just a moment ago, [talk show host] Thomas Gottschalk came by to buy a pair of FH Jakes, and right now we have the former Germany manager of Apple, Freddie Geier, at the store. So we not only have entertainers amongst our clientele, but also business icons. What kind of styles will be making a splash this year? For 2013, the only thing left are massive plastic nerd glasses and nerdy metal frames from the 1980s and 90s. FreudenHaus is not only a store but its own brand. How did that happen? Well, that path was already predestined somehow. We knew that we wanted to sell eyewear, so we’d tell our suppliers exactly what we wanted. To which they replied: “If you really know you need something, why not just make it yourselves?” So we did, and designed our first small collection. That’s how things got going. To this day, our store is the foundation for our eyewear designs. We’ll ask, what kind of glasses do our customers want? And we pay close attention and critically investigate our clients. For us, eyewear is a part of a person – and that’s how we go about our design process. Glasses need to fit their wearers, and not “overwhelm” them. So it’s about the right mixture of design, Zeitgeist, customer profile and honesty. Are the stores and the label run by the same people or are there individual taskforces behind the scenes? When Stefan Flatscher and myself founded FreudenHaus, we initially did everything together. But it soon turned out that it’s better to divide up individual tasks and counsel each other – one playing devil’s advocate to the other. This division of power has really paid off over the years. Stefan handles the design of our glasses and I’ll feed him my input. Where can people buy your glasses? At our FreudenHaus stores and select opticians around the world. The upscale ones, the ones reading your magazine. Hey, thanks! How do you see the development of eyewear as a fashion accessory? How important is the lifestyle factor when customers decide in favor of a certain model? There will always be customers who indeed will treat glasses just like an accessory. So for them, the lifestyle component plays a strong role. For the larger number of customers buying high-end eyewear, glasses are more than just a fashion add-on, but part of their own personality. What’s most important to customers: brand, functionality or style? At our store on Odeonsplatz it’s definitely style. Brands will factor into the purchase decision, but nobody is asking for fashion labels here. When it comes to shades, things are different and you really need brands. Munich may not be that relevant when it comes to soccer [laughs], but you’re still one of the richest cities in the country. Is that an advantage for opticians selling pricy eyewear? It really isn’t that easy to tap into the purchasing power. You need to have some skills. It only works when you really know what you’re doing. And you shouldn’t patronize your customers. You’re mostly dealing with people that are really well informed and intelligent. They pay close attention to what they spend their hard-earned money on. At the end of the day, you need to be able to look at yourself in the mirror and say, “Everything I did today was honest and beneficial toward our customers.” But to answer your initial question: Yes, it’s a big advantage to sell expensive and extravagant eyewear in an affluent city – and it’s lots of fun! Munich is also the site of the annual opti tradeshow. Does this bring some out-of-town opticians into your store in search of ideas? It’s always a lot of fun during opti. We’ll have other opticians come by the store on a secret mission, undercover if you will. Totally crazy what they’ll want to know. They’ll think we don’t catch on to the fact that they’re fellow opticians. The cool ones will just drop by, say who they ware and ask if they may take a stroll through the store. We’ll even give them the tour with some water and coffee or a glass of champagne. We welcome inquiries by our colleagues, and we’re also a bit proud to have them come visit. What do you see for the future of the eyewear industry? A land of milk and honey, or the ruins of Greece? The optical industry will always be a land of plenty with an underlying Greek philosophy. The number of people wearing glasses will continue to rise. The demands facing the eyes as sensory organs are getting more and more complex, so glasses are becoming more important as well. But one thing is for sure: The kind of opticians trying to be all things to all people will lose their market share. The labels will be sold via the Internet, but a real pair of glasses with the right lenses will remain the domain of knowledgeable opticians with a service offering. But the days when an optician only needed to open the store in the morning to keep things moving are clearly over. Ultimately, we are selling a product that customers are wearing right in the middle of their faces. This should be plenty of motivation for opticians to do a good job. More and more colleagues are seeing it this way, so I’m optimistic that specialty opticians will continue to do good business in the future. Just doing everything on the cheap all the time just isn’t fun. Upscale watches have also managed to become hip and trendy – and high-end eyewear is on a similar path. Let’s push this movement forward! With so much entrepreneurial activity, we’re tempted to ask if you’re eyeing any ventures outside the eyewear industry? Yes, we’d like to market our own FreudenHaus brand vodka. But we need someone to bottle it. No matter how rough things get, what would FreudenHaus never be caught doing? Not drinking vodka and selling people crappy eyewear.